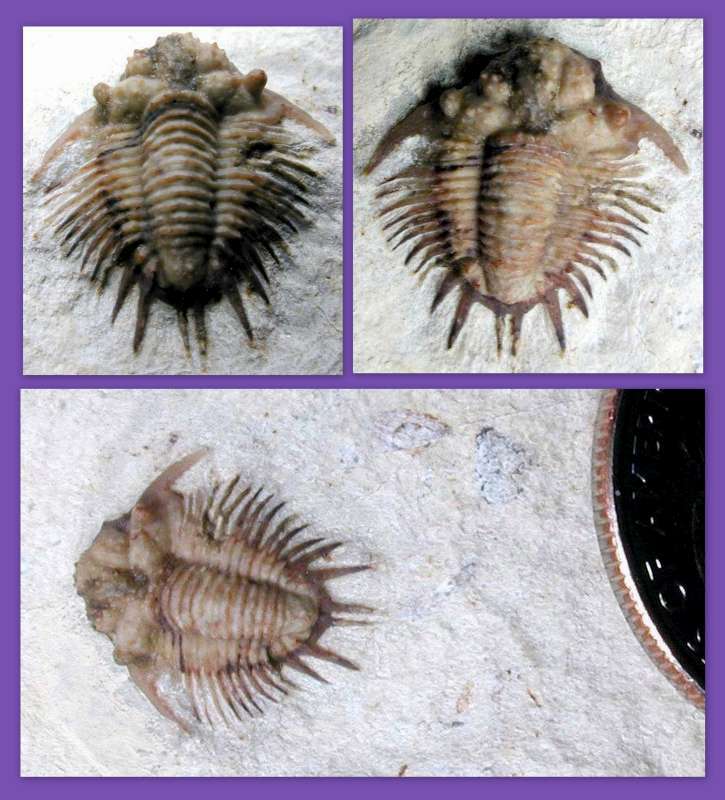 Only one species of these trilobites is assigned with little ambiguity. It has been commonly called Bug X, but belongs to Acanthopyge (Belenopyge) consanguinea. Fragments from a number of other species require continued investigation, including Oinochoe and Echinolichas to mention just two. 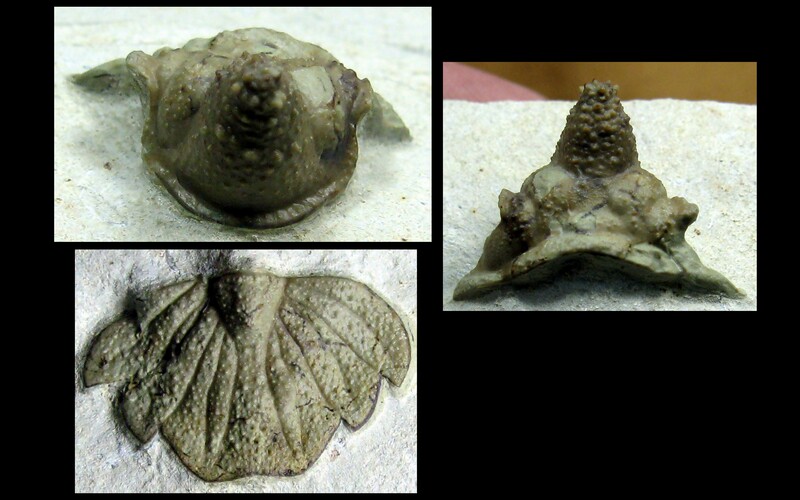 This genus was named for the wine-jug shape of its glabella. Hence the classical Greek name Oinochoe. Pronunciation of this little used word is: oy-knock-oo-ee, where the first syllable sounds like "joy" and the emphasis is on the second syllable. 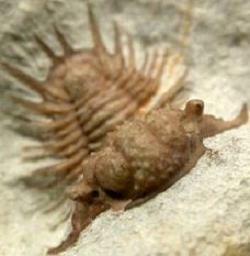 Occasional appearances of fragments of this trilobite suggest this is possibly the largest trilobite in Haragan rocks. 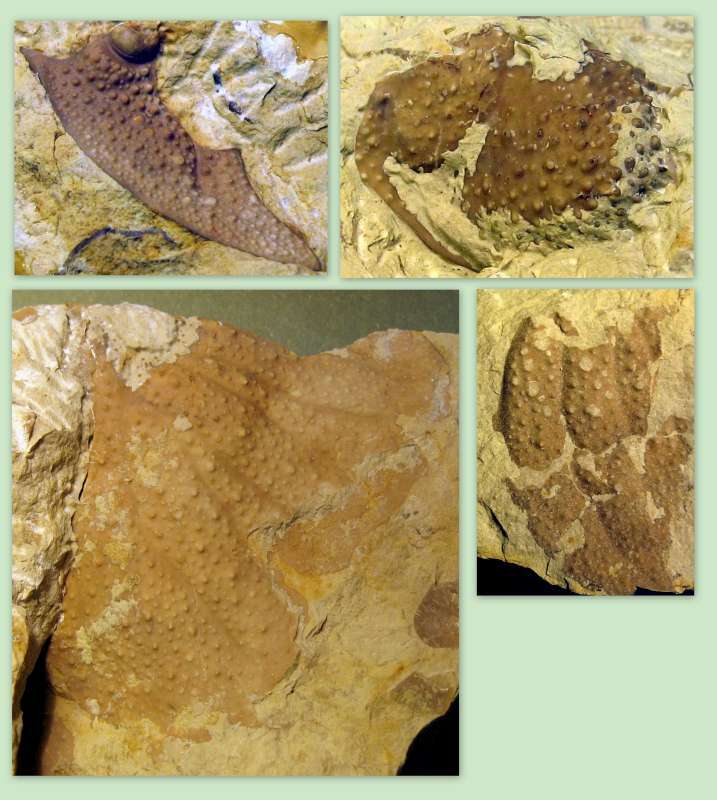 Upper left shows a complete free cheek, approximately 4 cm in length. Upper right appears to be a glabellar fragment. 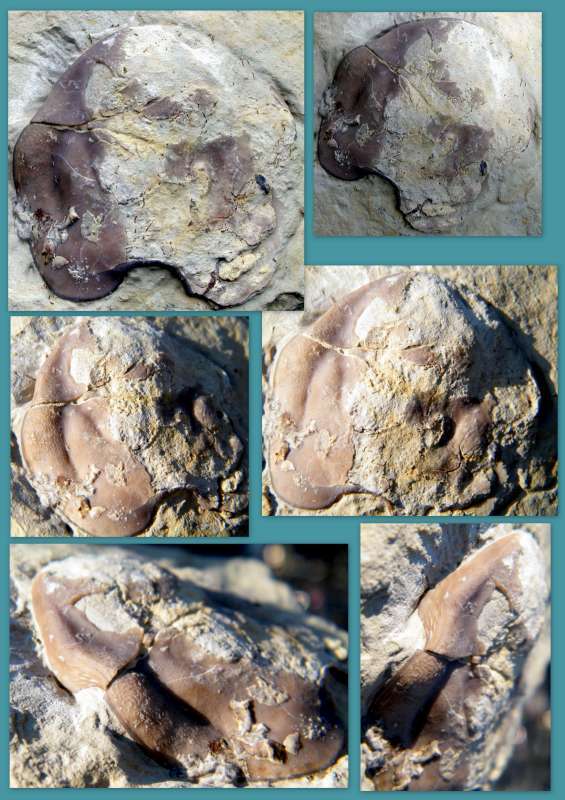 Lower left is nearly half of a pygidium, approximately 10 cm in axial length. 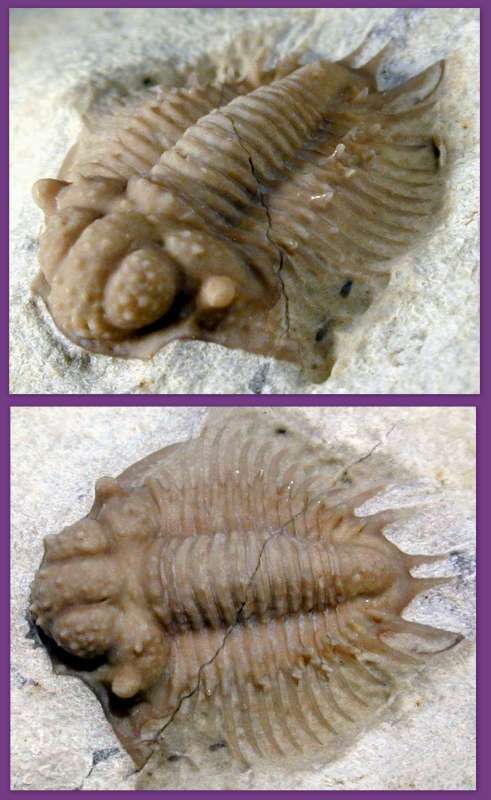 Two intact fragments of Echinolichas? coccymelum are shown in the photographic collage below. The upper figures show two views of the same cranidium (central cephalic structure without the free cheeks). The lower figure shows the nearly complete pygidium. Campbell assigned two distinct cranidia to this species, making this assignment suspect. Below is a collage of photographs taken by G.P. Hansen and Bill Rushlau. Bill found the specimen in Haragan rocks at Black Cat Mountain. About the diameter of a quarter dollar, it compares to the hypostome of Echinolichas ? coccymelum figured in K.S. W. Campbell's monograph ( Plate 39, Fig. 3a and 3b). In the edge view photographs at the bottom of the collage, I have attempted to capture the structure of the terrace ridges along the border of this specimen. Acanthopyge (Belenopyge) consanguinea is the only lichid found regularly in nearly complete condition. This is a modestly rare species, with fewer than 30 specimens found in the last 20 years of excavation at Black Cat Mountain. While this species is normally about 1 cm in length, smaller specimens are possible. Consider the size of the consanguinea shown in the collage below, with a quarter dollar shown in the bottom image for size. This one was about 5 mm in length. In the body of my book consanguinea was assigned to the subgenus Lobopyge within the genus Acanthopyge. While I noted that Lobopyge was a name preoccupied by another taxon, I was unaware of the nearly simultaneous publication by Huseyin Ozdikmen who had identified 20 such preoccupations and proposed alternative names for the genera. My friend Enrico Bonino made me aware of this essential new work by Ozdikmen, an arachnologist from Turkey, for which I am very appreciative. 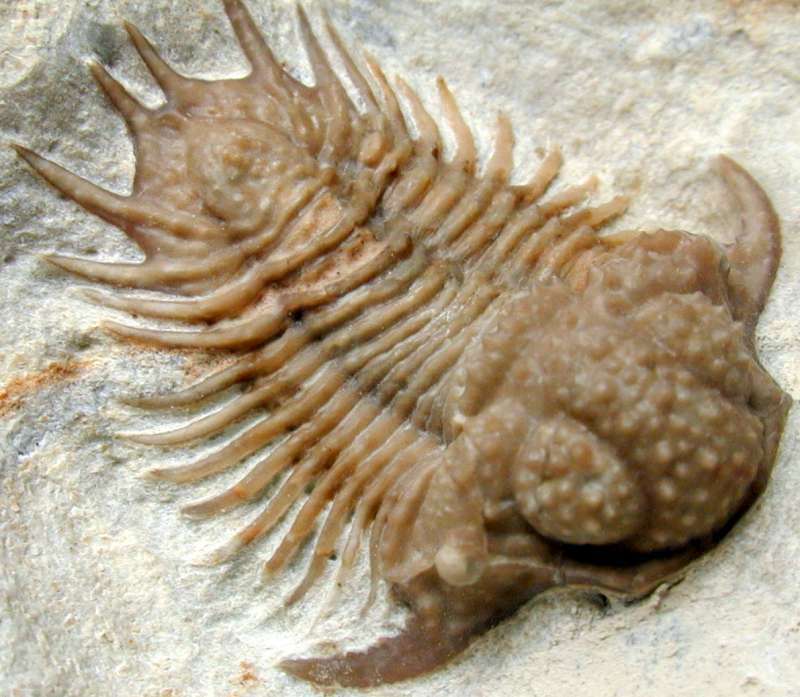 The full citation follows: Huseyin Ozdikmen 2009, Nomenclature Changes for Twenty Trilobite Genera, Munis Entomology & Zoology Vol. 4, No. 1, pp. 155-171.